Want to know how to go to Nami Island from Seoul (Myeongdong/ Dongdaemun/ Hongdae)? Check the comprehensive guide in here to know what things to do in the Nami Island and how to get there. Generally, there are 3 ways to go to Nami Island from Seoul (Myeongdong/ Dongdaemun/ Hongdae). You will know the above 3 methods in detailed later. Nami Island is one of the most unique attractions in South Korea and it always crowded with tourists. Hence, don’t miss out this amazing place when you travel to Seoul. This beautiful island which located near to Seoul and it offers pretty scenery all year round. It’s a great photo shoot location with full of stunning scenery. If you plan to visit Nami Island, you can visit Petite France and The Garden of Morning Calm too. These two tourist spots are near to Nami Island. In short, you can visit these 3 beautiful attractions in a day. In this blog post, I have divided into 4 sections. In this section, you will know how to go back to Seoul from Nami Island/ Petite France/ The Garden of Morning Calm as well. You can choose one of the assembly locations to get on the bus: Myeongdong, Dongdaemun and Hongdae. I have created a table to show you the price between Day Tour and Private Car Tour. So, you can know which one is suitable for you. Highly recommended going there on a weekday and avoid going there on public holidays in South Korea to prevent too crowded happen. What Things to do in Nami Island, Petite France and The Garden of Morning Calm ? Nami Island – Is a beautiful island consists of many beautiful trees, nice scenery, natural, relaxing and romantic place. This island always occupied with local and foreign tourists for all seasons. What activities you can do in Nami Island ? Walk through and experience the different types of beautiful tree-lane like Metasequoia trees, Ginkgo trees, Cherry trees, Korea Pine Tree and Maple trees in the island. You will see the Gingko and Maple leaves was so spectacular during Spring and Autumn season. Enjoy to view the cherry blossoms blooming during Spring. In winter time, you will discover that the tree lanes were covered by snow and give you an incredible and heavenly feeling. It takes about 5 to 6 minutes from Jetty to Nami Island. *Free for Child aged 36 months and below. *Round-trip ferry fare and entrance fee. Petite France – Is a French Cultural Village with colorful French-Style buildings to showing their household culture, clothing and antique furniture. What activities you can do at Petite France ? The Garden of Morning Calm – Is an attractive garden full of beautiful, impressed and unique flowers. During winter all trees, flowers and leaves will be withered. But you will see a winter light decor at the garden to display colorful LED on the trees. What activities you can do at The Garden of Morning Calm ? *Last entry is 1 hour before closing. How To Go To Nami Island, Petite France and The Garden of Morning Calm from Seoul by ITX Train and Gapyeong City Tour Bus? One of the ways to get to Nami Island and nearby popular destinations is taking public transport but it will take longer time to reach there. You can take the ITX train from Seoul to Gapyeong and then hop-on the Gapyeong City Tour Bus to Nami Island and other well-known destinations in there. But it is highly suggested booking the ITX train tickets in advanced. This is to prevent don’t have seated available on that day and caused you unable to go there. Another method to go to Nami Island and other attractions places in there is joining day tour in Seoul. So, you don’t need to book the ITX train tickets online and also save your learning time about the methods of going there. Below are the step-by-step guide to Nami Island, Petite France and The Garden of Morning Calm by using Subway, ITX Train and Gapyeong City Tour Bus. Tap the Map above to see the walking steps to Cheongnyangni Train Station from Cheongnyangni Subway Station Exit 4. Tap the Numeric Markers on the Map to see the street view in order to get a better idea of walking direction toward the Cheongnyangni Train Station. Firstly, ride the Subway Line 1 to Cheongnyangni Subway Station and then take an Exit 4. After walked out from Exit 4, turn right and go straight. The Cheongnyangni Train Station just ahead on you. Go to Ticket Reservation site of ITX Train and then input the relevant information on that page. 7. Click on “Inquiry” button. *The reason to choose Cheongpyeong Station instead of Gapyeong Station as departing station is because the Cheongpyeong Station is nearer to Petite France and Garden of Morning Calm. Then, you will see all available departure time from Cheongnyangni Station to Gapyeong Station. The “Magnifying Glass” icon allows you to check the train fare. Normally it cost about 4,800 Won for an adult and 2,400 Won for a child. Next, choose your preferred time to go there by clicking the “Select” link. Then, it will proceed to fill in personal information page. Highly recommended booking the earlier departing time (Around 8:00 AM) so that you have enough time to wander around the Nami Island and other nearby tourist spots in there. After selected your desired time for departing, then fill in your personal information now. *October 2018 Update: Adult ticket is 4,800 Won and Child ticket is 2,400 Won. *November 2018 Update: The system has changed to request input password number instead of passport number. – Ensure your name, gender, nationality and email are input correctly. It’s going to use it to collect your train tickets on that day. After you made the payment, the Korail Train website will issue you the actual Korail train ticket directly. Print it out so that you can board the train directly at Cheongnyangni Station and don’t need to claim your train ticket at the ticket counter of Cheongnyangni Station anymore. You won’t see the below picture after done the payment instead they will bring you to the page that allow you to print out the train ticket from Cheongnyangni Station to Gapyeong Station. Last time, I need to bring my confirmation slip like picture below to collect the physical ticket at the Cheongnyangni Station. But, now you don’t need anymore. You can print it out online after you done the payment. I have called the Korail customer service, they told me that bring along the passport, printed train ticket and credit card that used to buy the train ticket online. – Don’t forget to bring along your passport, printed train ticket and credit card that you made the payment for ticket online. – Reach earlier so that you won’t miss the ITX train. – Don’t forget to book your return trip online as well. 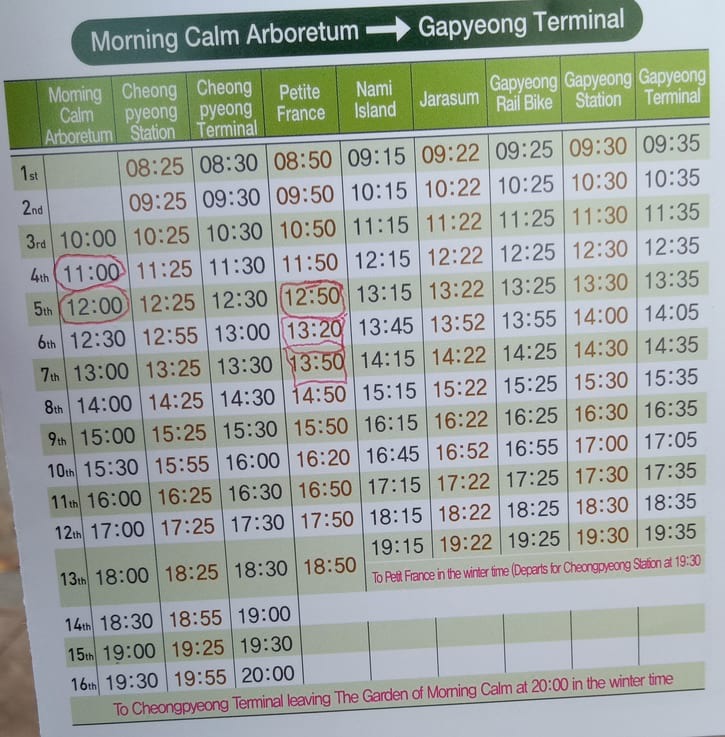 When you reach the Gapyeong Station, check with the staff in the train station to know where to queue for getting on the Gapyeong City Tour Bus. After knew it, walk to that location and get ready to hop-on the Gapyeong City Tour Bus to Nami Island jetty and other attractions in there. Normally, the tour bus will stop in front of Gapyeong Station (View). The bus fare is 6,000 Won for an adult and 4,000 Won for a child. But you can hop-on and hop-off the bus as many times as you like with one-time payment only. You can buy the bus ticket either by cash or using T-Money Card on that tour bus. You can get the timetable on the tour bus, so that you can plan when should leave the Nami Island and ride the bus to next destination. 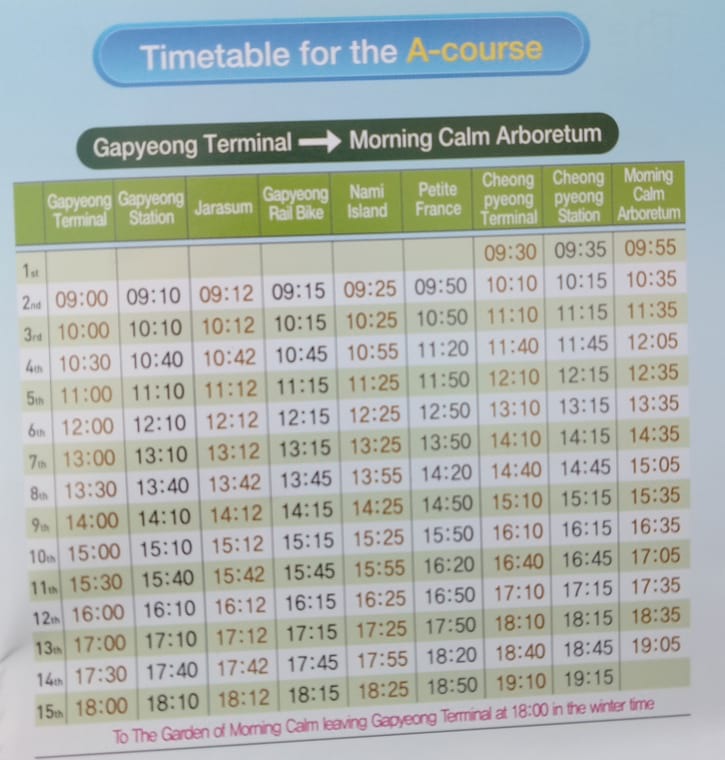 Below are the timetables of Gapyeong City Tour Bus. Once you reach Nami Island jetty, look for a ticket counter to buy a ferry ticket to Nami Island. The entrance fee and ferry ticket cost about 13,000 Won for an adult, 10,000 Won for a teenager and 7,000 Won for a child. After done buying the ticket, then prepare to queue for ferry to Nami Island. The area for waiting ferry is just near to the ticket counter. – Hop-on the Gapyeong Tour bus from Nami Island jetty and then hop-off the bus at Gapyeong Station. After that, ride the ITX Train back to Cheongnyangni Train Station. After finished visiting the beautiful island, you can take the ferry back to the place where the tour bus dropped you before. Walk to there and then hop-on the tour bus and heading to Petite France. – Take the Gapyeong Tour Bus to Cheongpyeong Station and then ride the ITX Train back to Cheongnyangni Train Station. Once finished touring at Petite France, catch the tour bus for Garden of Morning Calm. If you are looking for a convenient transportation and reasonable price to Nami Island and other tourist spots in there, then taking a day tour is a great choice for you. Soon, you will see my highly recommended day tour and budget tour to Nami Island that chosen my many travelers. Before knowing the popular day tours, let’s compare the expenses between ITX Train + Gapyeong Tour Bus and Day Tours. From the table above, you can discover that join Day Tour to Nami Island / Nami Island and Petite France is slightly cheaper than you go there via ITX Train and Gapyeong Bus. Conversely, if you want to join Day Tour to Nami Island, Petite France and The Garden or Morning Calm the price will be a little bit higher than you go there via ITX Train and Gapyeong Tour Bus. But the significant advantage of taking a day tour is you don’t need to headache and think about how to get to Nami Island, Petite France and The Garden of Morning Calm. Furthermore, you even can skip the queue for buying ferry and entrance tickets because they will prepare all the required tickets for you. Hence, you just need to get on the shuttle bus and they will bring you directly to the destinations. So, get ready yourself to have fun and enjoy the amazing island and other nearby popular places that you wish to visit. Apart from this, you don’t need to worry about when should get off the train or bus and then transfer to another subway station or bus stop. 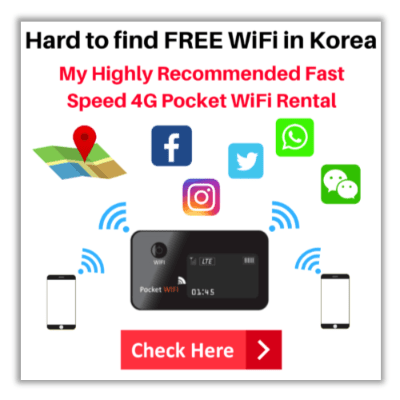 This can help to save your time to navigate train station or bus stop that you needed for transferring in order to reach the Nami Island. In addition, you also can eliminate stressful of finding train station and anxiety of asking for direction without knowing Korean language. Taking day tour able to help you avoid missing out a chance to visit the beautiful and romantic island trip in South Korea due to get on wrong train if go by yourself. Let them take care of you and bring you to Nami Island, Petite France and The Garden of Morning Calm with secure, comfortable and relax ways. Click here to see the Budget Tour Package ! Click here to see the package ! There are 3 popular assembly locations for you to choose one of it to join the day tour. Besides, these 3 assembly locations are very simple to find because it’s just outside of each exit stations. There are several tours packages available for you to choose one of it in order to meet your desired. All are included ferry and entrance tickets. On the other hand, if you interested to visit Nami Island ONLY then you can select one of the meeting points below to get on the bus. It also has included ferry and entrance ticket. However, you need to take a short distance walking about 5 minutes from the exit of underground station to the meeting point. You may get to know guide to the assembly point from underground station at booking site. Below are the assembly locations for going Nami Island only. Therefore, these day tours are suitable for solo, couples, group of friends and family members who prefer going to Nami Island and/or other nearby famous spots with affordable price and convenient way. 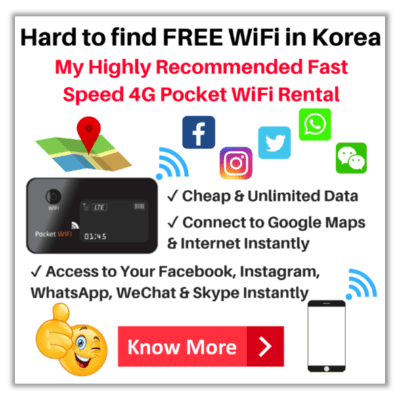 What Is The Fastest Way To Reach Nami Island and Other Nearby Popular Places Without Hassle and Saving Time ? 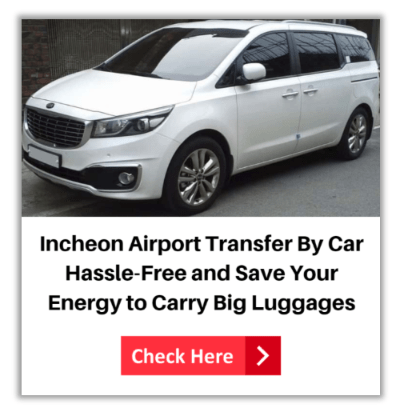 The quickest, flexible and save your travel time methods to Nami Island, Petite France and The Garden of Morning Calm is hiring a private car or van service to bring you there. Based on the table above, we can aware that joining Nami Island or Nami Island and Petite France Day Tour is cheaper than hire a private car charter. The private car charter price only has a slightly expensive compared to the Nami Island, Petite France and Garden of Morning Calm Day Tour for a group of 6 travelers. If your group has less than 6 people then joining day tour is better than private car charter. It can help you all to save some pocket money. 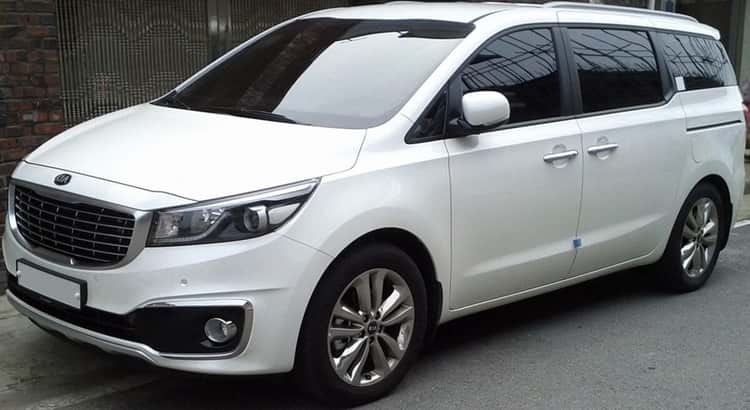 On the other hand, if you have a small group of friends or family members with 6 people who prefer visiting Nami Island, Petite France and Garden of Morning Calm then you can consider to choose private car charter. One of the main benefits of taking private car charter is you totally don’t need to deal with public transport. This is because they will provide hotel pick-up and drop-off service. Hence, you just need to get on the car in front of your hotel and let your driver bring you to there with safety, relax and comfortable ways. Furthermore, it allows you to choose where you want to go first based on your preference. In addition, you can choose which destination to stay for longer time and other for shorter time. It is totally control by you and following your schedule. Therefore, you can enjoy seeing the wonderful things in Nami Island, Petite France and The Garden of Morning Calm at a slower pace without rushing. Apart from this, the private car service is suitable for parents travel with kids and elderly. If taken via train, senior citizens need to get up and down the stairs. This might difficult for them and caused them easily get tired. Thus, taking a car service can help them to take a good rest in car. So, they can enjoy the beautiful and natural island as much as possible without experience stressed up and tired. Other that this, private car service also suitable for a group of friends who want to have a free time to explore the Nami Island and other nearby popular spots at their own pace. Besides that, your driver know to speak Chinese and English. Thus, you don’t need to worry about language communication problem if you have something wish to ask them. The price of private car or van service will be cheaper if go by small group of friends or family members. In short, this service is great for those who want simple, fast, save time and flexible ways to visit the amazing Nami Island, Petite France and Morning Calm Garden. In current busy working life and/or required spend time to take care kids make your trip planning even harder. This may cause you don’t have enough time to find a proper solution of reaching there. I believe that everyone also hope that can plan a proper trip to Nami Island so that won’t let your partner/friends/family members disappointed. 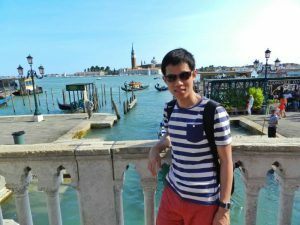 Thus, I sincerely hope that this blog post has provided a great value to you and save your study time about methods of getting there. Kindly share this post to your friends on Facebook or Twitter if you found it was helpful to them. Which transport mode you will choose to there ? What are the things you wish to know before going to the island ? Hi 🙂 I would just like to ask if the price list on your blog is updated? Thank you. The price will keep fluctuation and it’s depend on the season and promotion. But, you can check the latest price of Nami Island Day Tour in here. If you like to know the latest entrance fees of Nami Island, Petite France and The Garden of Morning Calm, you can check the price from the official website links. I have provided the attractions official website links on this page so that easier for you to check the latest prices. Hi, we are thinking to visit Nami Island next month with 2 kids. We would like to know how difficulty to reach Nami Island? Is there any subway directly go to Nami Island from Seoul? So, I don’t need to buy train tickets in advance. Would appreciate for your answers. Thanks. Great! Nami Island is a must-go place if you visit Seoul. Unfortunately, there is no direct subway from Seoul to Nami Island. If you prefer taking public transport mode, then you must take ITX Train and Gapyeong Tour Bus to reach Nami Island. Better book the ITX Train tickets in advance if you choose to use public transport mode to there. Worried that no seat available if you only buy train tickets on that day. 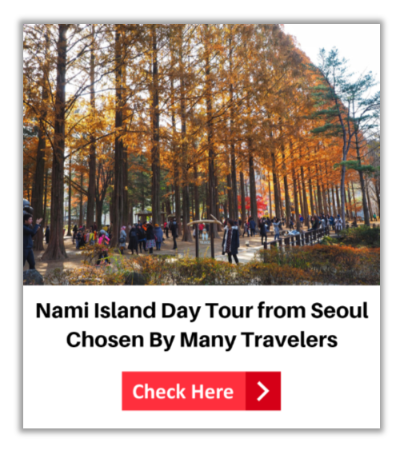 You can read my step-by-step guide to Nami Island here to know how to book ITX Train ticket online and also how to get there via Gapyeong Tour Bus. Alternative, you can join Day Tour to Nami Island if you want simple and easy ways to Nami Island. You will be surprise that the Nami Island Day Tour is slightly cheaper than you take public transport to there. Thank you so much for your detailed information. Do we need to book the entrance tickets in advance or buy the tickets on the spots? Thanks for your kind words, Jessie. Hope that my guide able to help you to plan a day trip to Nami Island. The entrance tickets don’t need to book in advance and you can buy on the spots. After read through your blog, we are planning to visit Nami Island, Petite France and The Garden of Morning Calm in the Autumn. Thank you so much for sharing such useful information. Truly informative! You are welcome, Mei Chi. 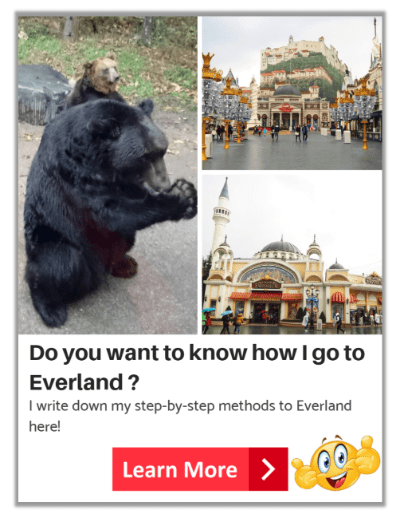 I hope that my guide in here able to help you solve the doubt about how to go to Nami Island. Most people didn’t aware that there are popular spots near to Nami Island such as Petite France and The Garden of Morning Calm. Actually, they can visit those places with Nami Island in one day and then back to Seoul. Hope that my sharing in here able to help you all plan a well trip to those places. Have fun and happy holidays in South Korea! I planning to Nami Island this December. When I made my train ticket reservation at Korail website, instead of Passport Number, it ask for Password. So I keyin a password number and not my passport number. When I fill in my credit card number and click Next, it said My Payment is complete without asking for TAC number. I’m afraid later when I go to the station to collect my ticket they won’t give it to me because it’s not same with my passport number. By the way, the Password column only accept number and not alphabet and number. That’s why I didn’t keyin my passport number. When I try to contact Korail, there is no email address on their website. Only Korail Customer Service Center number. For precaution, I’m planning to cancel my ticket for refund with KRW400 penalty as my ticket is on Sunday and reserve a new ticket again. For me, I think it should be fine. Since the system is asking the Password number instead of Passport number. Make sure that your name and email address are correct. You can tell them your system is requesting Password number instead of Passport number when you redeem the train ticket. May be you can screenshot the page that asking Password number and show them if they said not same as passport number. If you worry that your reservation are not valid, you may contact Korail Customer Service Center. I think this is the only way to approach them. Thanks a lot for your update information. Travelers are more convenient to board the train by just print out the tickets after done the payment at Korail website. That’s truly great and they don’t need to line-up for claiming physical tickets at ticket counter of ITX train station. I will update the information in my blog post so that readers can get latest information of booking ITX train to Gapyeong Station. Wish you have an enjoyable holidays in Nami Island and Seoul! Thanks so much for the info and lovely photos. Hope you can help a bit. Yes, you can take metro from Myeongdong to Gapyeong Station. But it will take longer time to reach Gapyeong Station compared to ITX Train. At least 24 stops from Myeongdong to Gapyeong Station. Great for visiting Nami Island, Petite France and The Garden of Morning Calm! Try to catch the first Gapyeong City Tour Bus to Nami Island so that you have more time to enjoy in Nami Island. Since February 2019 is Winter Season, here is my suggested route for you: Nami Island > Petite France > The Garden of Morning Calm. I would suggest to visit The Garden of Morning Calm at last stop so that you can see the colorful LED lighting in the evening and night-time. After visiting The Garden of Morning Calm, you can take the Gapyeong City Tour Bus to Cheongpyeong Station. Then, take the metro back to Myeongdong. For me, I would suggest you to take ITX Train instead of metro. So, you have more time to spend at the attractions. But, you still can get there by metro. I’m so glad to have found your blog, it is very detailed and informative. We are planning to visit Nami sometime this October. We will be traveling with 2 young kids, a teenager and 3 adults. We plan to stay overnight at Nami Island, I believe there is only one hotel to book. Anyway, I’m quite confuse how to get there. The Day tour you mentioned with the arranged tour bus is usually same day round trip right? I mean, this does not apply staying overnight there? I’m quite confuse with the ITX train you mentioned, we will probably be staying in Myeongdong.. is it easy to find or board the ITX train from there? or is there a bus ride from myeongdong that goes directly to Nami without train transfer, etc..? Your suggestions are highly appreciated. Thanks and Regards. The Nami Island Day Tour Bus is same day round trip and without staying overnight. You should take the subway from Myeongdong Station to Cheongnyangni Subway Station and then walk to Cheongnyangni Train Station to board the ITX train to Gapyeong Station. There is no ITX train station at Myeongdong. Sorry, I’m not sure whether got Public Bus to Nami Island or not. If you want to stay overnight, you can plan to use ITX train. Hope that my information can help you. Yes, you can take the Gapyeong Tour Bus from Nami Island Jetty to Gapyeong Station. Then, take the ITX Train back to Seoul. If you want convenient way to Nami Island without transferring, you can consider taking round-trip shuttle bus to Nami Island from Seoul. The shuttle bus will bring you directly to the Jetty of Nami Island.